Leah describes how Orleanna takes the news of Ruth May’s death. She’s eerily calm, as if she already knew what had happened. Nathan’s reaction is different—he says that Ruth May wasn’t baptized yet. Leah finds this reaction pathetic—how can her father focus on a thing that that? Leah believes that Nathan hadn’t baptized Ruth May because he wanted to make a great show of the baptism, and was waiting for the proper time. Once again, the eerie calmness of this scene makes it all the more emotional for readers: the characters’ inability to express their feelings makes the feelings seem stronger. The irony here is that Ruth May, by Nathan’s own standard, is going to hell herself: Nathan has been so focused on the Congolese that he’s neglected his duties to his own family. Outside, Nelson is making a “funeral arch” out of leaves. Leah and her sisters pray to God for Ruth May’s soul, mostly out of habit. It begins to rain, and Nathan stares out at the clouds and quotes Bible verses. Slowly, a crowd forms around the house—it’s morning now, and the children of the village are awake. As it rains, the children approach Nathan. Nathan quotes Bible verses, and touches each child’s head, completing the baptism ritual. In this cathartic climax, we see all the characters at their worst and best. Nathan is just as focused on baptism as ever, but here his actions are oddly sympathetic: it’s as if the universe is giving him a break from his struggle to dip the children in the river. Leah and her sisters don’t believe in God much anymore, but they gather together, recognizing that they need to show some love and respect for their dead sister. Arn, Jackson. "The Poisonwood Bible Book 4, Chapter 61." 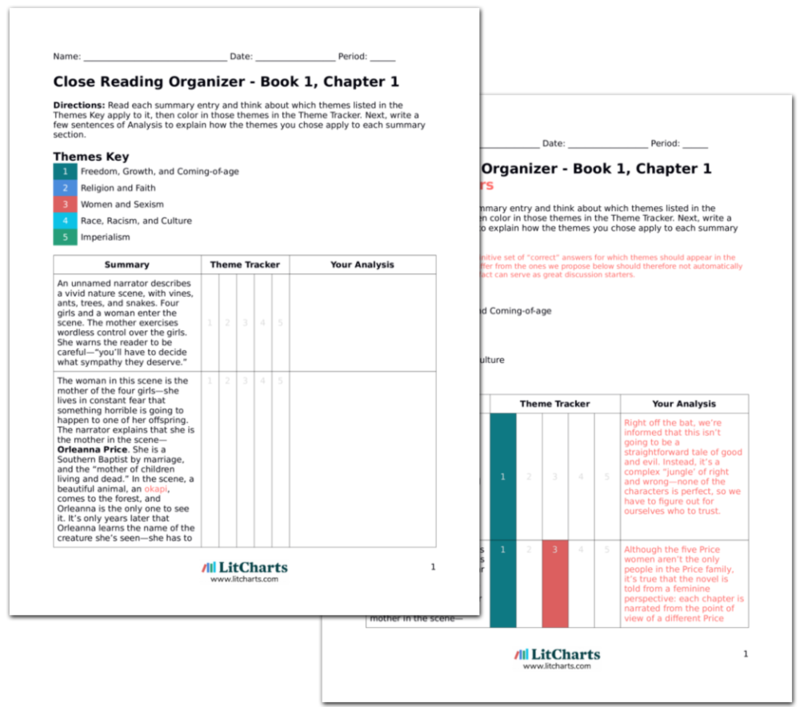 LitCharts. LitCharts LLC, 29 Jun 2016. Web. 18 Apr 2019. Arn, Jackson. "The Poisonwood Bible Book 4, Chapter 61." LitCharts LLC, June 29, 2016. 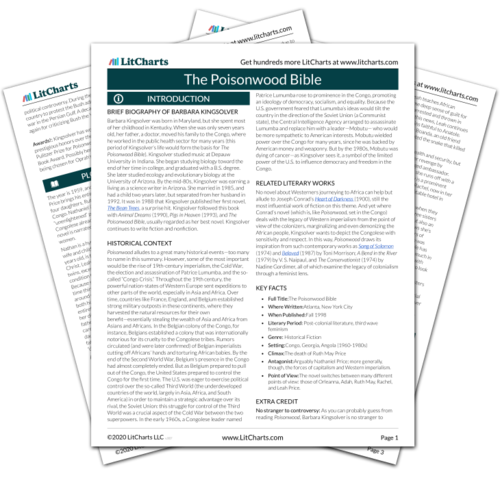 Retrieved April 18, 2019. https://www.litcharts.com/lit/the-poisonwood-bible/book-4-chapter-61.